I don't really know what I was thinking with the change of format with this strip. 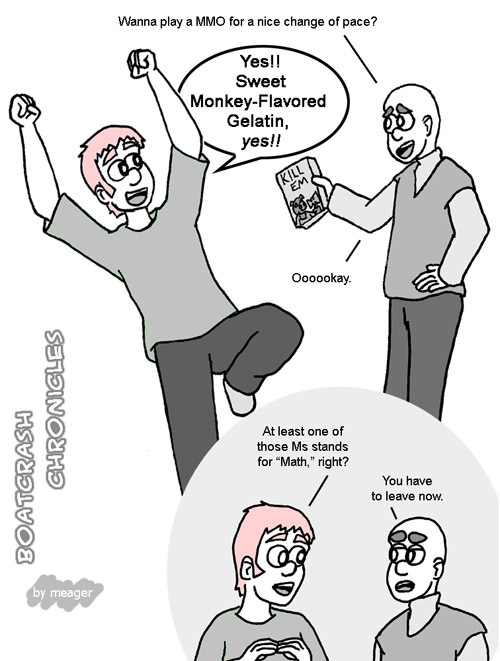 I was probably trying to shift focus from the fact that this comic was created solely to use the line "monkey-flavored gelatin". I really despise my linework in that second panel. I constantly look back at some of the awkward artwork in the these old strips and cringe. Of course, I look at some of my awkward artwork in stuff I've drawn last week and cringe, so at least there's consistency in that. I intentionally draw these strip in a quick manner, often so I can post it as close to the real-life happening as possible. But a big part of the creation of this webcomic was to help me get faster, and while that initially limits the quality, everything improves over time. I think I'm a significantly better cartoonist than when I started.